To M/T Vivi on the "Ships starting with V" page. Picture received (via Neil Carlsen) from Dag Midbøe who served on this ship from June-1939 until Nov.-1940. Some of the early voyage details given below were also received from him. (See also text for Leiv Eiriksson). Tonnage: 6546 gt, 9815 tdwt., 11 knots. Delivered from Akers mek. Verksted, Oslo in Oct.-1932 as Vivi to A/S Vestheim (Halfdan Ditlev-Simonsen & Co.), Oslo. 433' x 58.1' x 26.3'. Dbl. scr. 2 x 6 cyl. 4T singl. 550/100, 2300 bhp B&W DM, 11 knots. (Sister ship of M/T Dageid). Captain: Mads Ansgar Danielsen, from 1940 until the end of the war. Other crew members are named within the text. Under The Ministry of War Transport from Apr. 30-1940 and managed by Anglo-Iranian Oil Company. In service on the Atlantic and Far East, usually with aviation fuel. May 21 Bermuda portion joined main convoy   HX 43 Straggled May 24. June 12 Milford Haven   OB 166 For Gibraltar. Detached to OG 33, June 13. June 13 Joined from OB 166 Gibraltar June 19 OG 33 Convoy will be added. Dec. 25 Milford Haven   OB 265 For Port Arthur. March 26 Loch Ewe   OB 302 Dispersed March 30. June 7 Milford Haven   OB 331 Dispersed June 19. Aug. 10 Milford Haven   ON 6 For NYC. Oct. 1 Milford Haven   ON 22 For NYC. Jan. 13 Aden Suez Jan. 25* Independent *Page 2 gives arrival Jan. 19. May 25* Adelaide Port Pirie May 31 Independent *Page 3 gives departure May 29. June 26 Adelaide Abadan  Independent Page 3 gives arrival July 30. Sept. 19 Bandar Abbas   PB 3 For Melbourne. July 11 Sydney, N.S.W.   CO 108 Dispersed July 13. Haifa/Tripoli, Syria/Egypt to Aug. 22-1944. 1944 Aug. 23 Port Said Oran Sept. 2 GUS 50 Port Said to Oran. Sept. 11 Oran Baltimore Sept. 28 GUS 51 Oran to USA. Nov. 14 Belfast Lough Philadelphia Dec. 2 ON 266 Convoy will be added. Dec. 19 New York City Liverpool Jan. 3-1945 HX 327 See also narrative below. 1945 Jan. 13 Liverpool Cape Cod Canal Jan. 31* ON 278 *Page 5 gives arrival Jan. 29. Jan. 29 Cape Cod Canal New York City Jan. 30 Independent Fire Febr. 5-1945. May 5 New York City   NK 685 Detached May 10. Oct. 10 Bremerhaven Corpus Christi  Independent Page 6 gives arrival Nov. 2 (via Downs). Nov. 14* Corpus Christi Clyde Nov. 26 Independent *Page 6 gives departure Nov. 4 (via New York). Based on the captain's report, as well as crew member Dag Midbøe's documents. As will be seen, when comparing their info with the details found in the original archive images, some dates are different, but rather than correcting them I've left them as they appear in the captain's report and/or Midbøe's docs. The information has been compared to, and supplemented with, convoy information from misc. other sources. Follow the links provided for more details - several Norwegian ships took part (all the HX convoys will later be updated, for now, go to ships in all HX convoys). In the summer of 1939, Vivi was in coastal service between various ports in the U.K.: Liverpool-Hull-Stanford le Hope-Swansea-Avonmouth-Falmouth, then went from Falmouth to Abadan. She departed Abadan for Lands End for orders on Aug. 8. Due to the outbreak of war, she was ordered into Lisbon on Sept. 4, then proceeded to Liverpool, arriving Oct. 18-1939, leaving Liverpool on Oct. 20 for Corpus Christi, arriving Nov. 10. Left Corpus Christi on Nov. 22 for Gothenburg via Bergen, Norway, but was stopped by a British Naval vessel on Dec. 7 and taken into Kirkwall that same day. Departed Kirkwall for Bergen on Dec. 11 with arrival the following day, leaving that same day (Dec. 12) for Gothenburg, where she arrived on Dec. 16-1939. "Germany has invaded Norway and Denmark. As a result, all Danish and Norwegian shipping is to be taken under British protection. You must therefore go straight to a British Port and report to the Naval Control Service Officer. He will give you orders for your safety and instructions about the route you should follow. You may go to any of the following ports: Halifax (Nova Scotia), Bermuda, Nassau (Bahamas), Kingston (Jamaica), and Port of Spain (Trinidad). Please inform me which port you choose and your expected time of arrival. In the meantime, you should make preparations for painting out the National emblems on your side, and for darkening your ship if so ordered. Do not make any wireless signal except to report enemy attack or in case of distress. The Naval Control Service Officer will arrange for you to communicate with your owners on arrival." Signed Charles Yambe, Captain Royal Navy. Vivi headed for Port of Spain (arrived Apr. 15), where they had to wait for quite a while before all the necessary papers etc. were in order (see my page about Nortraship for info on the difficulties experienced by Norwegian ships in those early days of the war). Many other Norwegian ships were already there, with more arriving every day until there were about 25-30 Norwegian ships waiting for further orders. Once everything had been taken care of, she picked up a cargo of petrol (on Scheme to Anglo-Saxon) - she left Port of Spain on May 8, arrived Bermuda May 15, joining convoy Convoy BHX 43 that same day and arrived Avonmouth on May 30. After the petrol had been discharged (possibly in Cardiff, where she had arrived from Avonmouth on June 5), she was sent to Abadan on June 8 to load aviation fuel for the U.K. By the time the convoy* she was in reached Gibraltar, Italy had entered the war (June 10-1940) and the convoy was routed around South Africa. Vivi stopped at Cape Town, where she was ordered to have degaussing and protection around the bridge installed in Port Elisabeth. This was done, and she continued to Abadan, where she arrived on Aug. 14. The aviation fuel was loaded and on Aug. 16, she started on her return voyage to the U.K., via Cape Town and Freetown (arr. Sept. 28) for convoy. She joined Convoy SL 50 in Freetown on Oct. 3 (see the external link provided in the Voyage Record - the Norwegian Beduin, Maridal and Salamis are also listed). On arrival Barry Roads on Oct. 26 they had to wait for quite a while before they could continue and had some nerve racking moments, because several other ships around them struck mines that had been dropped in the area by German aircraft. 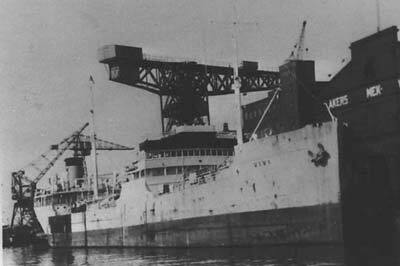 She left Barry Roads on Nov. 5-1940 and arrived Avonmouth that same day. Please compare these details with the information found on Page 1 of the archive documents, as well as the above Voyage Record (as already mentioned, some of the dates are different). * Vivi is listed in Convoy OB 166 in this time period (external link). The convoy originated in Liverpool on June 11-1940 and joined up with Convoy OA 166 on the 13th, the combined convoy forming Convoy OG 33, which arrived Gibraltar on June 19. This convoy will be added to an individual page in my Convoys section, in the meantime, the ships sailing in it are named on the page listing ships in all OG convoys. After her aviation fuel had been discharged, Vivi went to Barry Docks for the installation of armament, before she headed across the Atlantic (it'll be noticed, when going back to Page 1, that she spent several weeks in Barry). She's listed as bound for Port Arthur in Convoy OB 265, which originated in Liverpool on Dec. 26-1940 and dispersed on the 30th - again, see the external link in the table above; Bianca and Somerville (returned) are also mentioned. According to the archive document, Vivi arrived Port Arthur on Jan. 18-1941, having started out from Milford Haven on Dec. 25. She subsequently continued in this service, usually with aviation fuel. For instance, in Febr.-1941 she can be found in Convoy BHX 109 from Bermuda (main convoy will be added - see ships in all HX convoys - Augvald was sunk; follow the link for details), and towards the end of March we find her in Convoy OB 302, which originated in Liverpool on March 24 and dispersed 6 days later (also available via the external link in the Voyage Record - Alaska, Polartank, Solstad, Stigstad and Torvanger [Commodore Vessel] are also listed). No destination is given for Vivi on that occasion, but going back to Page 1, we see that she arrived Curacao on Apr. 16, having sailed from Loch Ewe on March 26. On Apr. 30, she joined Convoy HX 124 from Halifax, and in June she's listed, together with Barbro, Elg, Hardanger, Havsten, Hellen, Ida Knudsen, Solfonn, Torfinn Jarl and Troubdour, in Convoy OB 331, which originated in Liverpool June 8 and dispersed June 19, Vivi arriving Halifax on June 22, proceeding to New Orleans that same day - her voyages in this period are shown on Page 2. In July, she sailed back to the U.K. in Convoy HX 139 (the Commodore's report is also available), and the following month, she's listed as bound for New York with Convoy ON 6, which left Liverpool on Aug. 11-1941 and dispersed on the 24th, Vivi arriving New York Aug. 28. On Sept. 4, she shows up in station 76 of Convoy HX 148 from Halifax. Other Norwegian ships were Ørnefjell (55), James Hawson (83), Grey County (93), Stigstad (64), Idefjord (35), Egda (54), Herbrand (52) and Mirlo (23), as well as the Panamanian Norvinn (Norwegian managers, therefore listed on this website, station 53 - A. Hague has also included Gefion). Early the following month, she joined the westbound Convoy ON 22*, originating in Liverpool Oct. 2, dispersed Oct. 15, Vivi arriving New York Oct. 19. Eglantine is named among the escorts - see ON convoy escorts. She now took on board a cargo for South Africa, then went from there to Abadan, and later made some voyages from the latter port to Suez, India and Australia - again, see Page 2, as well as Page 3. In Dec. 1942, she arrived San Pedro where she underwent an extensive overhaul which took 6 months, meaning she was not ready to go back to sea until June-1943, at which time she started carrying diesel oil and crude oil as well as fuel oil, often short voyages. She had loaded diesel oil in San Pedro for Australia, then went to Abadan where cargo was loaded for Port Said and Alexandria. She subsequently carried crude oil between Tripoli and Haifa (as will be seen on Page 3, she had a long stay in Haifa in the fall of 1943), with an occasional voyage to Port Said and Alexandria with fuel oil (see also Page 4 and Page 5), continuing in this type of service until Aug.-1944, when she was sent to the U.S. for repairs of misc. damages (convoy info in Voyage Record). These repairs may have been done in Baltimore - it'll be noticed, when going back to the archive document, that she had a long stay there in the fall of 1944. Vivi now entered Trans-Antlantic service again for the rest of the war. She joined Convoy HX 316 from New York in Oct.-1944, bound for Belfast and Heysham (Commodore in Abraham Lincoln, Vice Commodore in Brimanger), returning across the Atlantic with Convoy ON 266* (departure Southend Nov. 12, arrival New York Dec. 3; Vivi arrived Philadelphia Dec. 2, having started out from Belfast Lough on Nov. 14). She was scheduled for HX 324 from New York on Dec. 4, but did not sail and was also cancelled from HX 325 and HX 326. She eventually got away with HX 327 on Dec. 19, for which the Norwegian Ivaran served as Commodore Vessel. Vivi arrived Manchester, via Liverpool and Eastham, on Jan. 6-1945 (Page 5). * The ON convoys will be added to individual pages in my Convoys section in due course, along with further details on each. In the meantime, the ships sailing in them (and escorts) are named in the section listing ships in all ON convoys. As will be seen, they all had several Norwegian ships. Vivi had a complement of 40 at the time. Captain Danielsen and Able Seaman Hjalmar Gundersen had gone ashore in a motorboat at 08:45 that morning, just before the alarm was sounded, when the tanker Springhill was seen to be on fire. In a letter from Nortraship, New York to Nortraship, London it was stated that the two ships were about 50-100 meters away from Vivi when the accident happened. An able seaman still on board had seen the collision and realized immediately that the situation was dangerous, so he ran down to his cabin to get his lifevest, but by the time he got back on deck, the fire had already reached Vivi, which was only about 50 yards away from Springhill. Clio had been inward bound in ballast when she ran into the T2 tanker (according to A. Hague, Clio had arrived New York from Puerto la Cruz on Jan. 31, and returned to Puerto la Cruz on Febr. 8). Burning aviation fuel was flung high up in the air and landed all around Vivi, as well as on her deck. Efforts were made to rescue some of Springhill's men who had jumped overboard and were swimming and drifting with the current towards Vivi, but these efforts had to be abandoned when she herself was engulfed in flames. The starboard aft boat and the 2 rafts there were launched, while those amidships could not be reached because of the smoke and flames. 25 men were able to get into the lifeboat, but it was quickly surrounded by the flames and set on fire, so they had to jump overboard and try to save themselves by swimming away as fast as they could. Some were picked up by the U.S Coast Guard's vessels and by tugs which had arrived on the scene, and were as quickly as possible taken to the U.S. Marine Hospital, Staten Island. Meanwhile, Chief Engineer Alfred Toftevaag, the 2nd Engineer and 4 mechanics were in the engine room, with the initial intent of starting the engine to get her out. But when she became surrounded by flames within minutes, and smoke started to fill the room, orders were given to abandon this idea and get off the ship. This proved to be impossible, however, so the chief gave orders for full speed ahead for both engines, and after 10 minutes the air was clear enough that they were able to escape through the emergency exit. Once on deck, Vivi was still seen to be on fire, but she was now out of the area of the burning fuel in the water. Their attempts to extinguish the fire had to be given up because they were unable to get any water flowing through the hose, but at that time fire fighters came alongside, and coast guard vessels took the 4 mechanics on board. The fire was extinguished at 11 o'clock. It so happened that the 6 who had stayed on board until it was too late to leave were, in fact, the ones who not only saved the ship by maneuvering her away from the fire, thereby enabling the coast guard and fire fighters to come alongside, but they were also the ones who had escaped injury altogether, while all those who had managed to get off the ship and into a lifeboat had varying degrees of injuries. The 1st mate and the boatswain had died when they ran to the front of the ship to try to lift anchor. Their bodies were later found together with that of the carpenter, and all 3 were buried in Brooklyn on Febr. 9-1945. Galley Boy Tu Chi Teze. Note that the Memorial for Seamen in Stavern, Norway, which I've linked to below, has added an 8th Norwegian casualty, namely 3rd Mate Peder A. Nilsen. A British gunner, Eric Gardner saved the life of his shipmate, the Norwegian gunner Yngvar Øistein Heier after they had abandoned the burning lifeboat. 2nd Mate at this time was J. Ødegård. In spite of the damages, Vivi's cargo and oil hoses on deck were unharmed, and a couple of days later the diesel oil was discharged. Following the fire, Vivi spent 3 months repairing in New York, and had just taken on a new cargo to continue her service, when word was received that the war had ended in Europe. Her subsequent voyages are shown on Page 5 and Page 6, up to and including Apr.-1946 - again, see also A. Hague's Voyage Record above. Sold in March-1955 for breaking up in the U.K.
Stavern Memorial commemorations - 8 Norwegians are commemorated at this memorial for seamen in Stavern, Norway. The names and titles correspond to the ones I've listed above. This website has added 3rd Mate Peder A. Nilsen. I looked him up in "Våre falne", a series of 4 books naming Norwegians who died during the war, but cannot find him. According to this book, Carpenter A. Anundsen is buried at Fresh Pond Crematory. Back to M/T Vivi on the "Ships starting with V" page. The text on this page was compiled with the help of: "Nortraships flåte", J. R. Hegland, "19 Oslo-skips historie under verdenskrigen, fra April 1940 til krigens slutt i 1945" (The story of 19 Oslo ships during WW II), Harald Nicolaisen - 1945, and misc. - (ref. My sources).